During the summer months, Jadrolinija runs a coastal ferry service from Rijeka in the north to Dubrovnik in the south, taking all night and all day about it. Calling in at Split, Stari Grad on Hvar, then Korčula and Mljet, until quite recently the route also included Bari in Italy. Going further back into the past, you could have boarded the ship in Venice, called into various ports along the Croatian coast, and ended up in Corfu. Sadly, the days of the long-distance ferries are numbered and rumour has it this will be the last year that we have the coastal route. 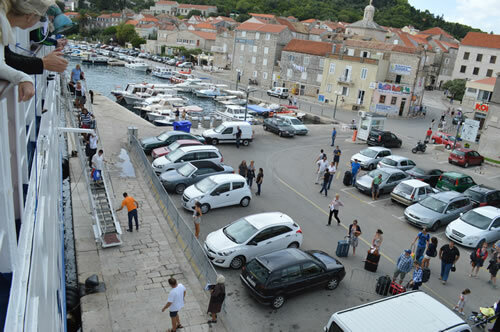 Not wanting to miss the opportunity, this September we took the ferry from Stari Grad on Hvar to Dubrovnik. 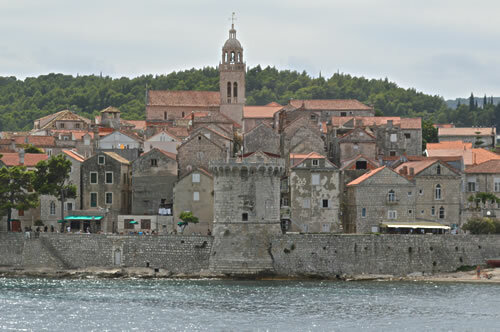 It travels south on Tuesday, returning on Thursday which gave us two nights and a day to enjoy Dubrovnik. What a lovely relaxing way to travel – no car required, and you both get to watch the glorious scenery. 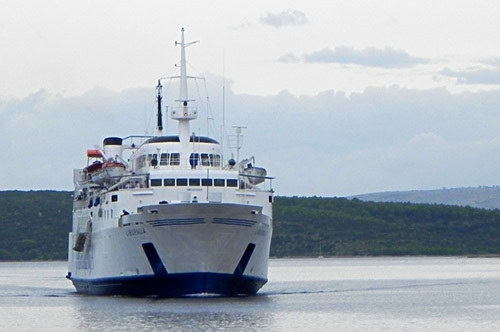 Our ship was the Liburnija, rather venerable at 48 years old, she was Jadrolinija’s first car ferry of any size, specially commissioned from a builder in the Netherlands. In the early days of Jadrolinija (set up in 1947) their fleet was all commissioned, not bought second hand, as they have done more recently. 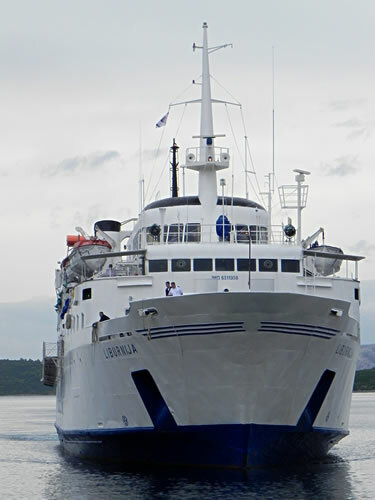 The Liburnija was built in 1965, and still retains the style of an older passenger ship, without having the size, space and extra power of the more modern equivalent. The benefit is, of course, that she can still dock at the smaller ports on the route. Foot passengers don’t wander on board across the vehicle ramp, but up a flight of steps on the side just like a real ship! She had set out on Monday evening from Rijeka and by now it was Tuesday morning. The disembarking passengers had a bleary-eyed and rumpled appearance as if they’d slept in their clothes. Which, of course, many of them had. Although the cabins are bookable, the seating is not. It’s first come, first served and we were lucky enough to find an empty window table for the four of us in the salon, where we made ourselves comfortable. My plan for the day was to fill in some gaps in my sketchbook journal, and I duly set out my painting kit. We also had our internet connection, so we could check email and get some reading/work done. The weather wasn’t as clear as I’d been hoping… frankly I’d seen myself sitting watching the glorious coastline go by in brilliant sunshine. Instead of which, it was rather dull and shrouded in mist for half the day. 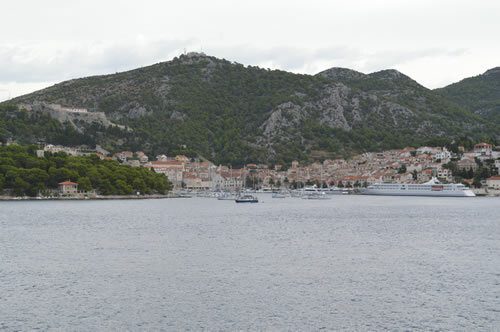 Setting forth from Stari Grad, the route follows the Hvar coastline round its westernmost point. It’s an area I haven’t much visited, as it is fairly inaccessible by road. The best way to see it is from the sea, little hidden coves with the occasional house tucked away in there. Nice! 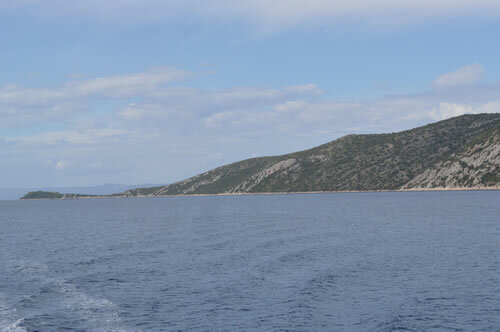 Round the point, we turned along the southern coast in the channel between Hvar and the Pakleni islands. 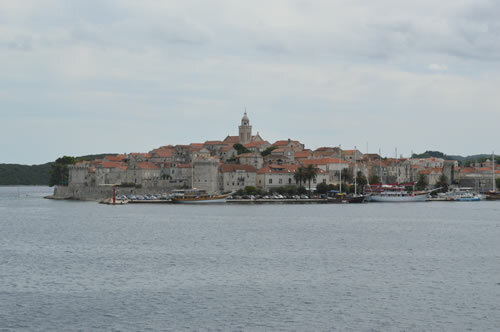 We went up on deck to take some photos as we passed by Hvar town, where the weather cooperated ever so slightly and we were close enough for a decent view. 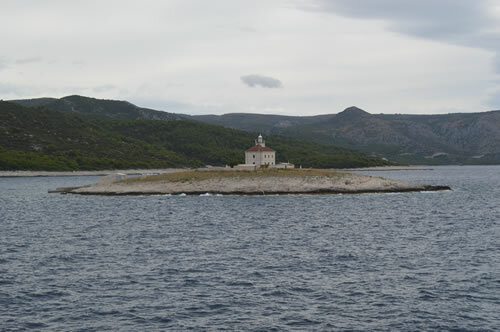 Just past Hvar is the small, rather bare island of Pokonji Dol with its lighthouse. I love it – even the lighthouses here are stone with red roofs! 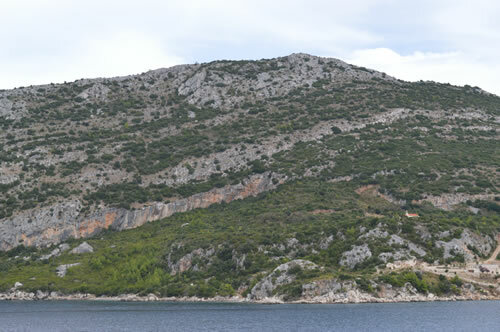 As we moved away from shore, views of the southern slopes and vineyards of Sveta Nedjelja and Ivan Dolac were not so clear as I’d wanted for the photos. We headed for the cafe as the Liburnija proceded on her stately way. Sveta Nedjelja and wine country Hvar-style! Hvar continued to drift past our window as we ate lunch. The cafe offered sandwiches and crisps, and we had brought with us a bottle of white wine courtesy of Konoba Lem – how very civilized! The restaurant downstairs was serving lunch, and they were kind enough to let us borrow some glasses! 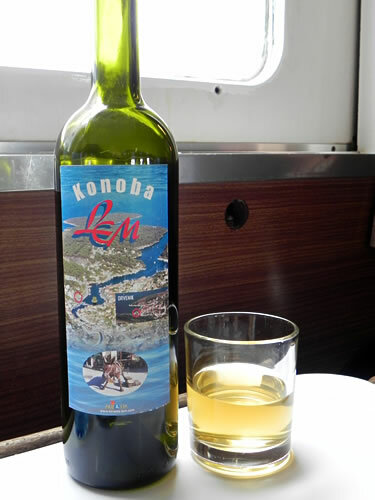 A glass of Konoba Lem wine with lunch! Outside, Korčula grew closer on the right, and Pelješac arrived close in to our left, quite low and dark. 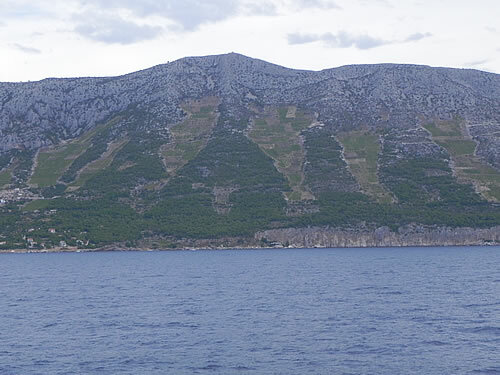 We were entering the fairly narrow channel that separates the island of Korčula from the mainland, in the form of the Pelješac peninsula. 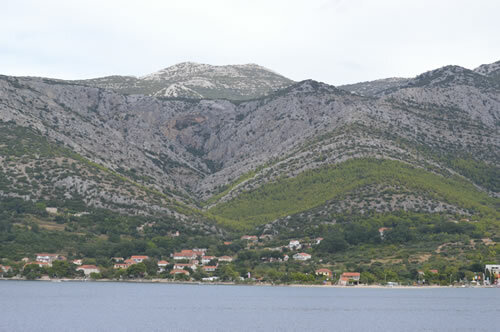 Northern tip of Pelješac – and the weather is clearing! Those mountains to our left were going to grow into a big stone wall as we continued south! For the moment, though, we swung to our right, and headed towards our next port of call, the rather beautiful town of Korčula. We made the most of our moving viewpoint to take some photos of the town as we sailed round, and docked in the south port. This is where you can see the benefit of the smaller ship. 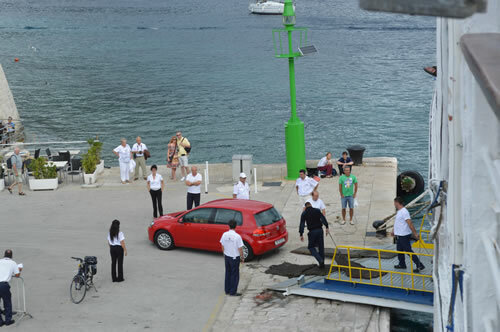 While foot passengers disembark down the steps, a ramp appears out of the side for the cars. It seems quite a few people are getting off here, and one day we should do that too! 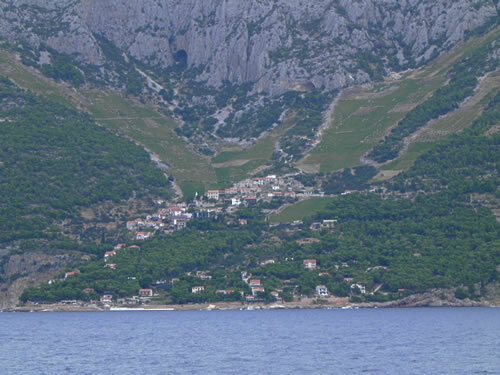 This looks like a wonderful place, and there are so many wineries on Korčula that we’d love to visit! Maybe next summer, assuming there is still a ferry to take us from one island to another. 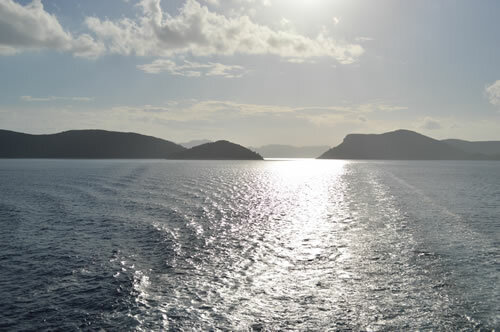 Our next stop is the island of Mljet, a lovely green island that is a national park. Unfortunately the part we see from the ferry port is probably not its best or most interesting side! We swap some more passengers and roll onwards. By now the light is fading somewhat, and we’re getting closer to our destination. The low sun gives a lovely silver effect on the islands behind us. Forward, we are beginning to glimpse the port of Dubrovnik in the distance. We begin to think about arrival, and start to pack up. My sketch of Korčula is done, and I’m rather proud of it, given how much concentration it took! 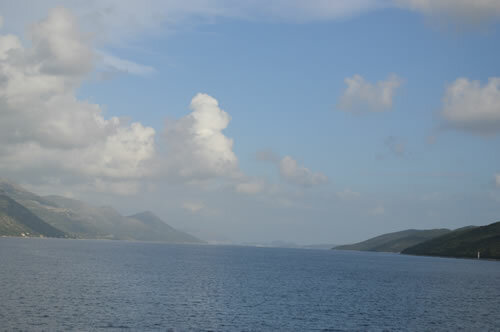 We arrived into Dubrovnik at 6:30pm, having set out from Stari Grad at 9:45am. Just in nice time to go and find dinner!